One key skill is to understanding how to boot system in to different runlevels. Everyone, who wants to attempt the Red Hat Certified System Administrator exam, should know how to boot into different runlevels during the boot process. This is explicitly described as an RHCSA requirement. In this section I will explain you how to boot system in to different runlevel for troubleshooting and maintenance. In this section you will use GRUB menu to boot in to different runlevels. 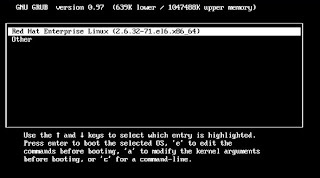 You will see menu similar to figure given below, from where you can modify how GRUB boots into Linux. If the menu is password protected, you will have to press p before entering the password. Then press a to access the kernel command line. At the end of kernel command line, type a space followed by the runlevel of your choice. For example 1 or single, 2,3, and 5. And press b to boot. You will now boot in to the runlevel you specified in above step. Reboot your system and you can see that now the system boots in its default runlevel, because editing kernel entries from GRUB menu does not make changes in /etc/inittab file which have an entry for default runlevel. To make your changes permanently you have to edit the /etc/inittab file. The main purpose for booting system into different runlevel is to correct serious problems in the system. And to correct we use the single-user mode or runlevel 1. These options/commands can be used at boot menu to booting in to different runlevel.